This study evaluated the effect of application of the semisynthetic triterpenes 3β-acetoxy-norlup-20-one (F4) and 3-chloro-4α,14α-dimethyl-5α-cholest-8-ene (F6) triterpene derivatives from Euphorbia officinarum on the growth of tomato seedlings under normal conditions and when challenged with the pathogens Verticillium dahliae and Agrobacterium tumefaciens. Foliar spray of F4 and F6 significantly improved growth rate, fresh weight, dry weight, and leaf area. In addition, they enhanced several physiological parameters including photosynthetic pigments, proline content, and nitrate reductase activity. Moreover, they induced H2O2 accumulation and increased the activity of several antioxidant enzymes such as catalase, ascorbate peroxidase, and guaiacol peroxidase. They also enhanced disease resistance against V. dahliae and A. tumefaciens. 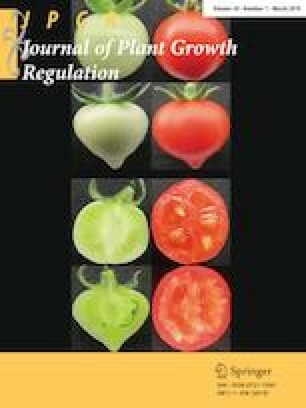 These results suggest that the two semisynthetic triterpenes represent new plant growth regulators and inducers of plant disease resistance. The online version of this article ( https://doi.org/10.1007/s00344-018-9838-3) contains supplementary material, which is available to authorized users. This research was supported by the University Chouaib Doukkali El Jadida (Morocco).